22nd March 1940. 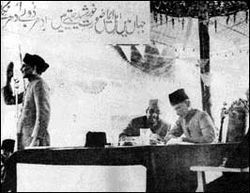 The 27th annual session of all India Muslim League took place in Minto Park, Lahore (Now called Allama Iqbal Park). Around 100,000 people attended the public meeting of the session. The special thing about this particular session was that it was about to change the course of history, at least for the Muslim Nation of the Indo Pak subcontinent. The day would be remembered by the “Indian Mussalmans” for centuries to come; the Quaid e Azam told the media on his arrival in Lahore that All India Muslim League was about to make a historic decision. Another significant thing about this historic session was that it took place beside the Badshahi Mosque and Lahore Fort, a symbol of past greatness and glory – a reminiscence of the Muslim rule of the Indian subcontinent that spanned over a millennium. The idea of an independent Muslim State was firstly and foremostly presented by Allama Iqbal in his famous “Allahabad address,” in 1930. Iqbal deemed it as the ‘final destiny’ of the Muslims Nation – a course which providence had chosen for them. However, God had been merciful enough to bless the Muslims of India with another great mind, Muhammad Ali Jinnah. Together, Jinnah and Iqbal may well be considered two of the greatest leaders ever to be born amongst the Muslim Nation. One had been the dreamer, the other would be the fighter. One had shown the way, the other would be the one to lead his nation to their destination. Although Iqbal was not present to witness the Pakistan Resolution taking place, his memory was honoured by the other Muslim leaders, and his aforementioned couplet graced the stage during the three-day annual session. In the recent past, the abolition of the Ottoman Caliphate had led to a general sentiment of depression and dejection amongst the Muslims of India, but now within a few decades the world witnessed a new ideology being formed – a new idea was in the making, and a new world soon to be created in the form of Pakistan. Iqbal saw Pakistan as our final destiny. It is both our destiny and our destination. A ‘fact’ we need to understand ourselves and also convey to our children: We are if Pakistan is! May Allah Bless you here and hereafter. We are proud of you Fatima. Your balanced views impressed me.